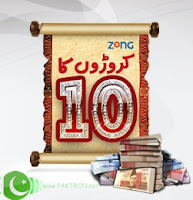 Zong Pakistan has announced its latest offer named as "Karoron Ka 10 offer" through a news paper advertisement by which Zong offers its customers a chance to win cash prizes worth more than a Crore Rupees. So participate in this amazing offer and make your dreams come true because campaign Duration is from July 18 to August 31. A support functionality has been developed for checking the daily spend. When a subscriber sends *221# he will receive his daily & monthly balance spend detail. The said functionality will facilitate customers in keeping a track on their daily spend. How does it work ? 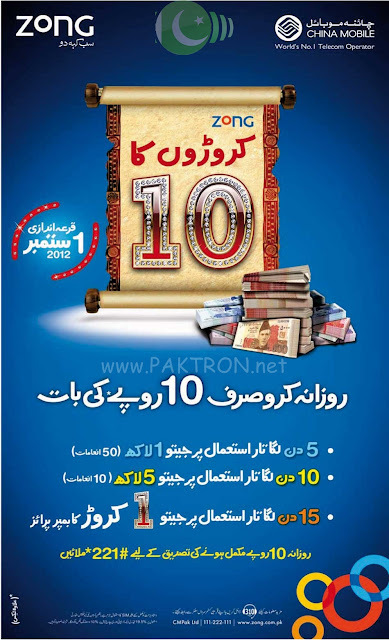 If a subscriber has continuous usage of Rs.10 + tax or more for 5, 10, 15 days respectively he will be eligible for different prizes. Usage Detail: Any activity that results in balance deduction. The more the consecutive usage by the customer, the more will be his/her chance of getting the prizes. This "Karoron Ka 10" or "Croron Ka 10" offer is only for zong Prepaid subscribers.